Dubai, United Arab Emirates, February 25, 2018: South Korean cosmetics brand ETUDE HOUSE will make its Middle East debut in early 2018, promising to make local customers’ beauty dreams come true with fun and playful products that unlock their unique beauty. With 229 stores globally, ETUDE HOUSE will open its first Middle Eastern store in Dubai in March 2018 followed by the next opening in Kuwait, at The Avenues. Korea’s leading beauty and makeup brand, ETUDE HOUSE is known for its innovative, trend-setting approach. The brand’s philosophy is that every woman was born a dignified and beautiful being that deserves to be valued, and its stores aim to create a culture of ‘makeup play’ in its stores, with feminine and playful products. Established in 1985, ETUDE HOUSE is present in 11 Asian markets as free-standing store. Throughout the years ETUDE HOUSE has been able to create a niche for itself in woman’s vanity boxes. 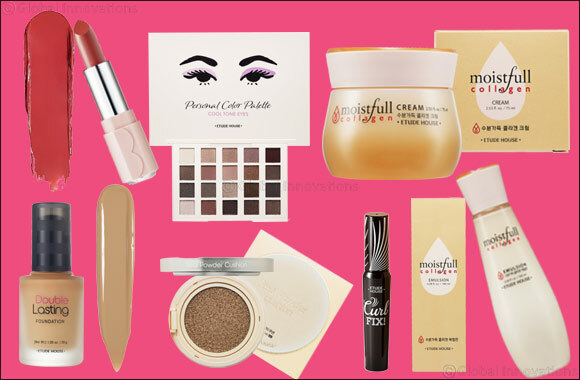 Keeping in sync with the demand for cosmetics in the Middle-East market, ETUDE HOUSE aims at bringing an array of the best sourced products to the region. The word 'Etude', meaning 'study or practice' in French language, originally refers to a short musical composition designed to be used as a practice material for perfecting techniques for a musical instrument. Just like a beautiful song is completed through numerous practices, ETUDE HOUSE wishes to help its consumers unlock their unique beauty by exploring the brand’s range of products and discovering the makeup styles that work for them. Personal Color Palette – Eyes – Hyper-pigmented and easy to blend, this cool-tone 20-shade shadow palette offers glitter, matte and glossy-looking lids in an instant. A light-weight non-comedogenic formula without a powder texture means these creamy shadows go on flawlessly without excess residue or chalkiness. Play 101 Stick Contour Duo – A creamy contour duo that creates a look of authentic dimensionality of face. Available in 6 shades. Real Powder Cushion – A cream-to-powder cushion solution, the Real Powder cushion reduces texturing on the skin for a flawless HD finish while staying light and grease-free all day. This innovative multitasking powder cushion provides all-day flawless face makeup with light and powdery finish. Shades developed exclusive to the Middle-East. Available in 14 shades. Moistfull Collagen - Skincare range that fills the skin with abundant moisture. Fascial Toner: Reveals skin youthful and angelic glow. Particles of Collagen water and Baobab water in the Moistfull Collagen Facial Toner, endlessly provide moisture and leaves skin hydrated. Essence: Provides moisture and leaves your skin radiant throughout the day. Em ulsion:Light on skin yet has a firm texture that adheres all the moisture and nutrients into the skin. Cream: Boost moisture all day. Immediately see a fresh vitality, leaving skin hydrated & healthy.